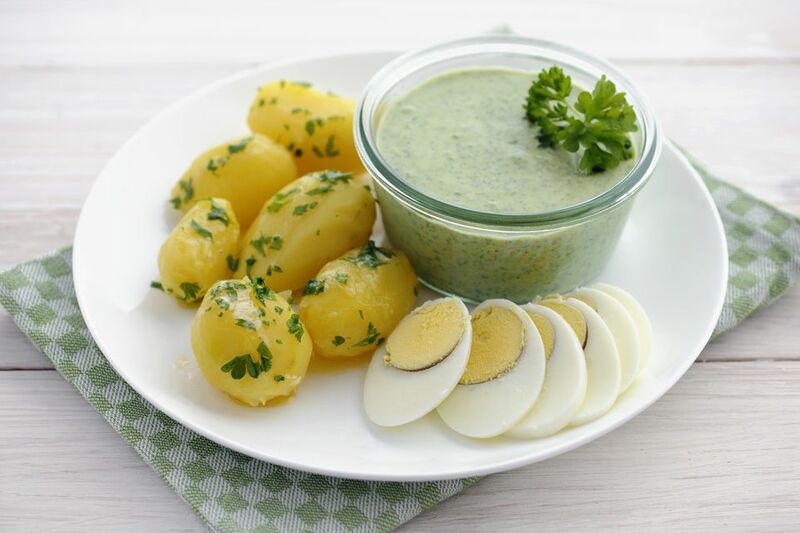 In Frankfurt dialect, this recipe for sour cream and herbs is called grie soβ. You can find the herbs used in this sauce packaged together and kitchen-ready in the Frankfurter region in Germany. No one else sells them like this, so you have to put together your own mixture if you do not live in the Frankfurt area. These herbs in German are borretsch, kerbel, kresse, petersilie, pimpinelle, sauerampfer und schnittlauch (borage, chervil, cress, parsley, salad burnet, sorrel, and chives). Some of these herbs are difficult to find outside of Germany. You may become adept at gathering the herbs wild, or several seed companies sell the stranger seeds, like borage and pimpernel (salad burnet). This sauce is served cold over hard-cooked eggs or hot boiled potatoes. In a medium bowl, mash the egg yolks with the oil and mix to form a smooth paste. Add a teaspoon or two of lemon juice. Mix in the quark, yogurt, and sour cream. Add the herbs and then season to taste with pepper, salt, and lemon juice. Transfer to a food processor or blender and process until herbs are reduced to very small pieces and cream is bright green. You can choose to sieve the mixture into a bowl to remove large pieces of herb or egg yolk. Serve cold over hot, boiled potatoes and hard-cooked eggs. Add dill and/or lemon balm. Try using this sauce as a bread dip or salad dressing.